The MOTHER of ALL Root Rakes! EXTREME DUTY! The BEST! AWESOME!!! Industrial Strength!- EXTREME DUTY!- Advanced Design! DON'T PAY RETAIL or DEALER PRICES!!! DON'T PAY $4000.00 for ATTACHMENTS!!! STEEL prices are rising, FUEL prices are rising...own it now before prices rise again...YOU MUST ACT FAST!!! The EXTREME DUTY Grapple Bucket Root Rake is a necessity in the tree industry as well as for contractors clearing a lot for home site building. It is also essential for farmers and ranchers- it is ideal for moving logs, brush, rocks, left over building supplies or just about anything else. The cylinders have a 2" bore and a 10" stroke, and operate independently to adjust for uneven loads. The hydraulic lines are routed inside the tubing to prevent tears. 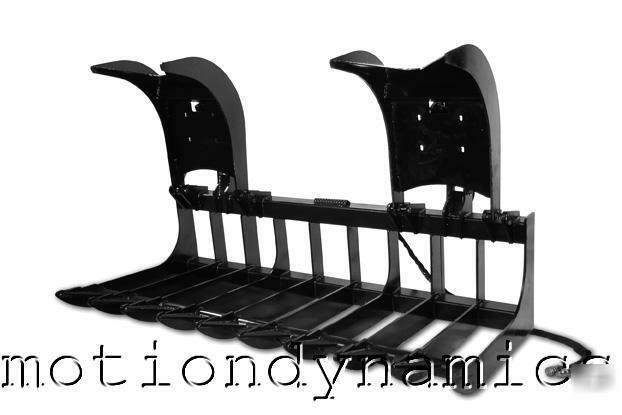 All tines on my EXTREME DUTY Grapple Bucket Root Rake are built with 1/2" top quality steel, oversized points and bushings, while every pivot point has counter sunk grease fittings. Every unit exceeds the lifting capacity of the skid steer machine it is used on. The grapple opening is 3 feet 2 inches, and has a depth of 34 inches. All content on this page & on all listings is TM & Copyright 2001-2006. MOTION DYNAMICS, LLC. All Rights Reserved.